Many of us look for childcare and preschool programs for a variety of reasons. We require childcare in order to return to work, and/or to have a break from our care-giving responsibilities. In addition, many parents are also eager (as we were) for their child to have an opportunity to be with other children in an educational setting. There are several different types of childcare options (in your home, in-home daycare, daycare centers, preschools) and you may have a preference for one over another. This is a very personal decision, but often when you have a special needs child, you are faced with having fewer choices. Under the IDEA (The Individuals with Disabilities and Education Act) children have access to public special education services outside of the home (drop-off programs) beginning at age three. Before this time you may have access to Early Intervention services which include home-based evaluations and therapies for your child. Since this program does not guarantee access to school based programs for three years, this is a critical time for special needs parents to have access to as many childcare resources as possible. For this reason, I am providing you with a place to start your search by compiling a list of childcare and preschool facilities who openly market themselves as welcoming our children (although in some cases, I have included some places that start at age 3 or later). These are not endorsements for these places, services or sites, and you will need to verify their licensing information. If I could not find a facility in your state I provided a link to the state agency that conducts the licensure for daycare facilities, and/or the state office that provides childcare referrals. We went through so many different hurdles trying to find the right people and places for our daughter and we have found them. I have learned that not all facilities and people who appeared to be “the best” were appropriate for my child, nor the most open-minded. In fact, we experienced much resistance and passive discrimination at a University hospital’s facility that was NAEYC accredited and had all of the bells and whistles. I was so naive in the beginning. I thought if we were reasonable with our expectations and because we had a good-natured disposition, we would be received in the same manner. This is not always the case. Perhaps, you will have a positive experience from the start and I hope you will be met with genuine compassion and open arms. If not, do not be disheartened. I have shed too many tears over people’s’ fear and stupidity when there are people and places out there willing and capable of caring for our children in a safe and stimulating environment. Sometimes the search is more labor intensive depending on how familiar people and places are with ADA guidelines. If you get discouraged contact your local Department of Social Services and ask for assistance. There is a federal grant program that allows each state to have a contact person available to provide education and assistance to childcare facilities about including our children. Each state will have a different name for this program so you may need to contact your local DSS for more information. The key is finding a facility with the desire and willingness to work with your child and family even if they do not know how. Once you have accomplished this, you may call upon a representative from a local organization to help get everyone working together. Do not waste your energy taking a moral stand on a facility you visit that is unwilling to work with you and has a poor attitude. Until you have completed an exhaustive search unsuccessfully, focus your efforts on finding the place that is going to welcome your child and will understand your needs along with ADA regulations. As special needs parents we need to conserve our energy whenever possible; so choose your battles and anger wisely. Many states are acknowledging the problems both facilities and families of special needs children are facing working together, and have started programs offering additional funds to facilities caring for a special needs child. Check with your state’s Department of Human Services about special needs childcare subsidies) Before you get angry about a bad experience, remember how little daycare workers typically earn, and the limited resources the facility may have access to (or what they feel they need) in order to appropriately accommodate your child. Many facilities also feel very vulnerable to lawsuits and we cannot really blame them. We live in a litigious society and when a special needs child or parent walks in the door, many people panic. Sometimes you find help in the most unlikely places. Spread the word that you are looking for help. Talk to other parents (particularly those people who have children with special needs), social workers, doctors, or whomever you know that is a good source of information related to caring for your child. Parent to parent groups and other advocacy organizations should have a list of centers and people they have already worked with to help establish inclusive programs. Perhaps there is a place that I have listed in your state that you find interesting but is far from where you live. Pick up the phone and call them. Ask them if they know of facilities or people in your area that could help you. You may have to have some flexibility with your expectations, but never let that flexibility include a potential compromise of your child’s safety. We have made compromises at various times. Our daughter has not always been in the least restrictive environment because the opportunities for something different were not supportive enough. We recently compromised on placing her in a preschool of a different religious affiliation than our own. The childcare and preschool searches have been lessons in patience, creativity, advocacy for my child, and offering up lots of prayers. Begin by a making list of what you are looking for in a facility. Determine with your child’s therapists and doctors what additional equipment, assistance or care your child may need to ensure his/her safety. You certainly want to be honest about your child’s needs because ultimately, you want to give the staff the opportunity to equip and educate themselves about how to best care for your child. Always visit the facilities that interest you and eventually bring your child there before making a decision. Remember, you want to have peace of mind when you drop your child off that he/she is being safely and appropriately cared for while you are gone. I have included some checklists and links to pamphlets about searching for childcare. This information will offer you some guidance as you get started. Keep in mind that these checklists were not created for the special needs childcare search. As the parent of a special needs child, and one with CP, we have our own list of concerns and issues to work through in addition to what concerns most parents. **Here is another parent’s reflections on her experience with finding the right preschool for her son in Australia. It’s called “How Could You Not Want My Child?”. Julie’s son is now 18 and she has had much experience negotiating how to open doors for her son. Check it out!! Has your facility ever cared for or had children with special needs before? If so, have any of these children ever had a physical handicap? Do you know or understand what cerebral palsy is? Is your staff willing or open to learning about how to best care for my child? Is your facility handicap accessible? Are there any areas that are not accessible? How closely would you be willing to communicate with me about concerns or issues that may arise with my child? How do you typically communicate with parents about their children and how often? Would you allow my child’s therapist/s to visit the facility and offer guidance about how to best support my child here? Would you allow my child’s therapists to come into the facility and work conduct therapy with my child? **This is very convenient if the facility does not offer on-site therapy and will save you time in the car traveling from one therapy appointment to the next. Are you nervous about having my child attend here? If so, can we talk about your concerns? **I have learned that people (even tenured educators) do not have accurate information about CP and I have been able to clear up a lot of confusion and fear simply by having an open and honest conversation. “5 signs of a good school for kids with special needs” by Ellen Seidman who blogs at Love That Max. “Creating a Teacher’s Resource Guide”-things to know about including Maya in your classroom. 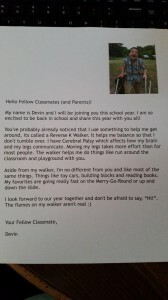 “8 Simple Rules for Teaching My Son With Cerebral Palsy” by Shasta Kearns Moore who blogs at Outrageous Fortune wrote a wonderful post detailing her guidance to her son’s pre-school teachers about how she and her husband would like them to approach him in the classroom. In order to help ease her son’s transition to his new class, Mom Christina wrote this letter from her son’s point of view How do you help your child with special needs transition into their new classroom or school? Appreciating Special Education Students’ Diversity-This is the best article I have seen on rethinking how we approach and educate children with special needs. Association of University Centers of Disabilities-a network of centers that serve as a bridge between the University and community. Their goal is to advance policy and practice by focusing on research, education and service to those people with disabilities. KIT-Kids Included Together-provides best practices training for community–based organizations committed to including children with and without disabilities into their recreational, child development and youth development programs. A very informative article about common misconceptions about IEPs. The National Disability Rights Network-Protection and Advocacy for Individuals with Disabilities-Every state has one! Below is a list of state by state (in the US) individual childcare search engines and information, as well as any known parent to parent organizations we have been able to find. Parent to parent organizations can be a wonderful resource for all types of information including daycare facilities and pre-schools that may best suit your child. Also, there may be times when you wish to understand more about your child’s education rights. Each state has a public agency dedicated to protecting the rights of people with disabilities. It is referred to as the National Disability Rights Network and they have a state by state director. Stone Soup Group — Assistance to families of children with special needs. California Making Access Possible — My congratulations to CA for their commitment to inclusion and the special needs community. This website is an outstanding resource. Illinois Child Care Resource **This is not a state agency. Cincinnati Children’s: Resources and database for special needs childcare. Great Start for Kids :state sponsored resource site, care facilities organized by county, search can include “CP” experience but no guarantee of accuracy here. All providers in this list are licensed by the state. Childcare Connections Gallatin, Park, Meagher Counties. This is a generic childcare search engine. North Dakota Childcare Resource This is a state site. Family Voices of North Dakota aims to achieve family-centered care for all children and youth with special health care needs and/or disabilities. Cincinnati Children’s Special Needs Childcare Directory: Resources and database of facilities. OCCYSHN Oregon Center for Children and Youths with Special Health Needs works with communities to more effectively meet the needs of children and their families. PEAL Center The Mission of the PEAL Center is to ensure that children, youth, and adults with disabilities and special health care needs lead rich, active lives and participate as full members of their schools and communities by providing training, information, and technical assistance based on best practices to individuals, families and all people who support them. Family Connections provides you with information, support and hope for the future. South Dakota Parent Connection connects families caring for children (birth to 26) with the full range of disabilities or special health care needs to information, training and resources in an environment of support, hope and respect. Tennessee Disability Coalition An alliance of organizations and individuals who have joined to promote the full and equal participation of men, women and children with disabilities in all aspects of life. Texas Parent to Parent is committed to improving the lives of Texas children who have disabilities, chronic illness, and/or special health care needs. Utah Parent Center works to help parents help their children, youth and young adults with all disabilities to live included, productive lives as members of the community. Vermont Family Network promotes better health, education, and well-being for children and families, with a focus on children and young adults with special needs. Parent to Parent Virginia believes in the innate strength of most families. Therefore, we have a philosophy that our services should affirm parents’ strengths and enable parents to obtain for themselves the services and supports their families need. PAVE a non-profit organization, exists to share information and resources with people whose lives are linked to children and adults with disabilities. WVPTI Works to empower parents of children and youth with disabilities in their roles as parents, decision makers, and advocates for their children and to promote partnerships among parents and professionals. Parent Information Center Statewide parent center for families of children with disabilities.